The art of pottery is oftentimes described as therapeutic and relaxing. While spinning clay, your mind and body are in natural synergy, wrapped around your creative ambitions and goals. This thoughtful, artistic activity can open up the mind and relieve you of outside worries. It engages the ‘effort-driven reward circuit’, which provides meaningful impact on your mental health, on a neurochemical level. One developer team knew all about this and delivered an amazing app to us. Meet ReallyMake, the most unique app that focuses on pottery. Let’s see what the app is all about! 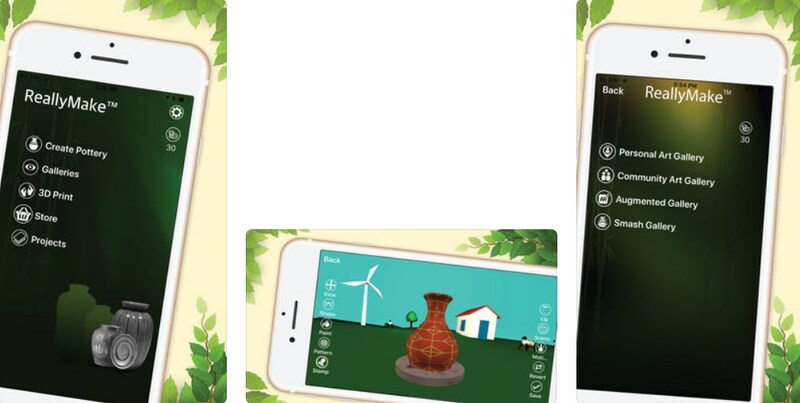 ReallyMake is an incredible cross-platform app that enables you to create your own custom pottery using your mobile phone or tablet. Available on Android, iOS and Amazon, the app is full of features that will provide you hours of fun. Prepare for molding, painting, stamping and customizing, for relaxation and expressing your creativity anywhere and anytime. Making pottery is more than just a game with the ReallyMake app. Basically, you’re enabled to mold clay, paint, choose patterns, use stamps and customize your pottery piece the way you like. Create beautiful ceramic and pottery pieces with the app’s tools, build your own private art gallery of your favorite self-made pottery pieces, share them on social media and other users so they can buy what they like (you will earn points). View your finished creations using the app’s Augmented Reality (AR). It will project your pottery on your table or floor to see what it looks like in the real world. Furthermore, ReallyMake allows you to 3D print your pottery after it’s finished. How amazing is that? Make stunning and original pottery creations, regardless of your skill level, download the ReallyMake app for free from the App Store, Google Play or Amazon.